Yesterday was the day we were all dreading. It had been in the works for months. We had made a couple of trial runs but the day had finally come to send the Bedford family to Fresno, CA. We started the weekend off with a going away party Friday night. The celebration began with a time of worship. I must say I am so proud of my husband for actually singing the songs and not crying instead. There was a slide show where we all wondered where the time had gone. We laughed, a lot. We cried, a lot. And we ate, a lot! We were joined by our wonderful friends Doug & Denise Kreighbaum. 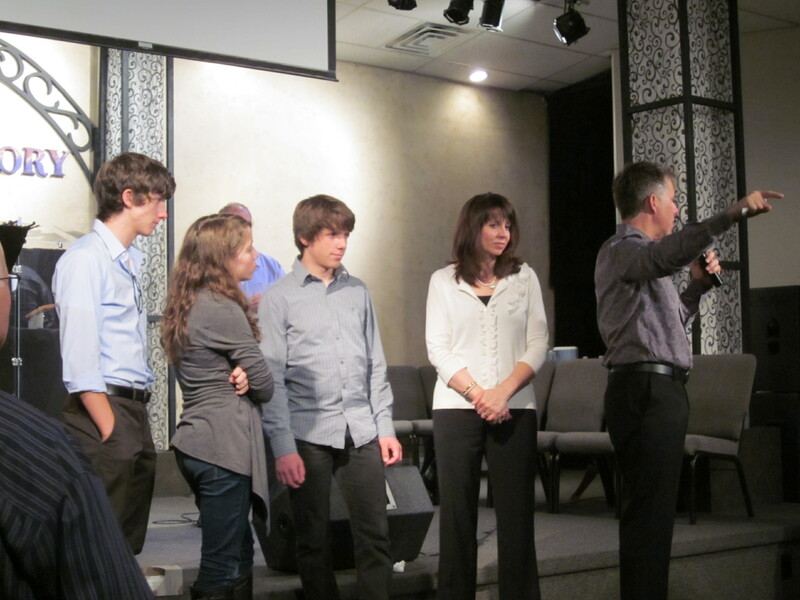 Doug was one of the founding pastors of our church so it was wonderful to have them on hand. When my family and I got home at 12:30am I told my husband I expected for Sunday’s final good-bye to be harder than the party. And it was indeed. I started crying at the first song. My plan had been to pace my crying (and emotions) but yeah, that didn’t happen. The Bedford’s have been here 16 years & we’ve been here 20. Harold & I have served alongside Tom & Andrea through good times and horrendous times. And we will be joining them in a few months in Fresno to help Bread of Life Church. Somehow I thought this fact would help me through the goodbyes. But the memories were too overwhelming. My favorite memory that pretty much sums up our personal and pastoral relationship with Tom occurred four years ago. So on the worst day of our life, the one where our only child nearly died, Tom was there, willing to stay with Evan until he either took his last breath or got on the life flight. If Evan had died holding Tom’s hand & not ours there would have been no one else who we would have wanted there. Fortunately for all of us that did not happen. We made it through Sunday and I have to say that while all of us at Life Church will miss the Bedford’s we are also excited for their next day in Fresno and our next day here. I am very grateful that my family and I get to be here for a while longer, helping anyway we can as our local body and leaders step into the next adventure God has for us. So off they go with the love and blessing of a very grateful church.